A venerable Waco law firm is combining forces with an East Texas firm to capitalize on Waco’s new reputation as a burgeoning destination for intellectual property lawsuits. Waco’s Haley & Olson, a business and commercial litigation firm that also represents about 75 governmental entities, and Mann, Tindel and Thompson, a specialized patent litigation firm with offices in Tyler and Henderson, have opened a new office at 913 Franklin Ave., in Waco, a stone’s throw from the federal courthouse. The joint venture will focus on patent infringement disputes, said Herb Bristow, a shareholder with Haley & Olson. Many familiar with IP litigation have predicted that Waco will become the new hot spot for patent lawsuits with the appointment of U.S. District Judge Alan Albright, an experienced IP litigator, and because of a U.S. Supreme Court ruling last year that requires patent cases to be filed in the district in which defendants are established or have a regular place of business. With Waco being in the same federal district as Austin, a target-rich environment for patent infringement lawsuits because of its large concentration of high-tech companies, and Albright’s IP expertise and open invitation to law firms to file those disputes in his court, the Waco court already has seen an increase in patent lawsuits. According to court records, only five patent cases were filed in Waco in 2016 and 2017. Since January 2018, 47 patent cases have been filed, including 25 so far this year. 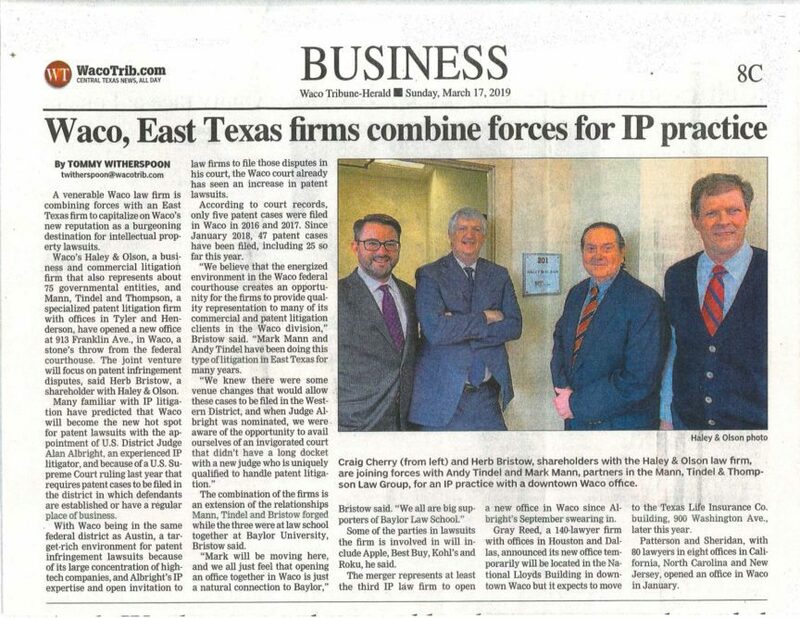 “We believe that the energized environment in the Waco federal courthouse creates an opportunity for the firms to provide quality representation to many of its commercial and patent litigation clients in the Waco division,” Bristow said. “Mark Mann and Andy Tindel have been doing this type of litigation in East Texas for many years. The combination of the firms is an extension of the relationships Mann, Tindel and Bristow forged while the three were at law school together at Baylor University, Bristow said. Some of the parties in lawsuits the firm is involved in will include Apple, Best Buy, Kohl’s and Roku, he said. 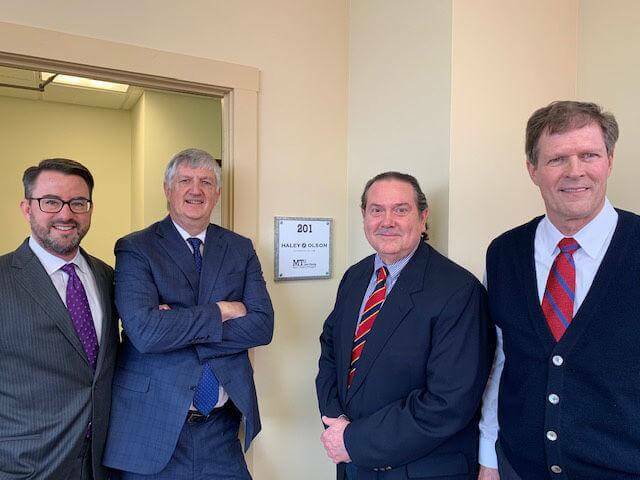 The merger represents at least the third IP law firm to open a new office in Waco since Albright’s September swearing in. Gray Reed, a 140-lawyer firm with offices in Houston and Dallas, announced its new office temporarily will be located in the National Lloyds Building in downtown Waco but it expects to move to the Texas Life Insurance Co. building, 900 Washington Ave., later this year. Patterson and Sheridan, with 80 lawyers in eight offices in California, North Carolina and New Jersey, opened an office in Waco in January.